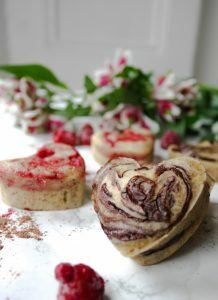 My Valentine’s Chocolate & Raspberry Fondants are Vegan & Gluten-Free, which means that everyone can enjoy them. I have used rice flour and almond meal flour as a substitute to wheat flour. Gluten-free cakes can sometimes feel heavy and a bit soggy, but the combination of rice and almond flour keep them soft and light. Which oil should we choose? Extra virgin olive oil and extra virgin rapeseed oil are both perfect in this recipe, so you are free to choose either one. I personally like extra virgin rapeseed oil better simply because I found its taste to be more neutral, which works wonder in baking, and also for its cheaper price tag. You must have seen the wonderful and dazzling fields of the bright yellow flowers from which extra virgin rapeseed oil is extracted. They look like field of sunshine. Rapeseed oil is a great alternative to other oils, it contains a very low amount of saturated fat and help prevent cardiovascular disease. Tips: choose to buy your oils in dark glass bottles as it will keep them fresher. 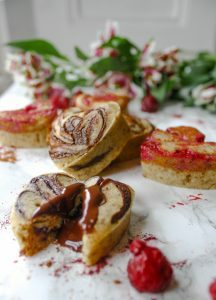 I am in love with those Valentine’s Chocolate & Raspberry Fondants – Vegan & Gluten-Free, for a few reasons. I love them because they are very easy and quick to make. I can just make them when coming back from work and they will be ready for a romantic dessert. 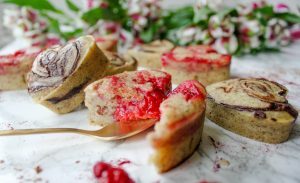 Finally, I love those Valentine’s Chocolate & Raspberry Fondants – Vegan & Gluten-Free because they are perfect to share with the one you love. I hope you try and like these Valentine’s Chocolate & Raspberry Fondants – Vegan & Gluten-Free! Share on Pinterest and tag a photo on Instagram #mimies_delicacies so that I can see your lovely creations as well as helping me reach more of you lovely people. Merci my friends! Chop the chocolate in small pieces, place in a bowl over a saucepan of simmering water (careful that the bowl does not touch the water as this could burn the chocolate). Stir from time to time, once the chocolate is melted remove the bowl and let it cool at room temperature. Wash the raspberries, place them in a shallow bowl and crush them with a fork, add the maple syrup and dairy-free milk. Leave in the fridge until ready to use. In a large bowl whisk together the rice flour, almond meal flour, baking powder, sugar cane, and salt. In a different bowl, mix together the dairy-free milk and rapeseed oil. Add the wet ingredients to the dry ingredients. Stir until thoroughly mixed and the batter is smooth. Pour 3 tbsp. of the batter into each mould. Then add 1 big tbsp. of the chocolate sauce in the middle and cover with more batter. 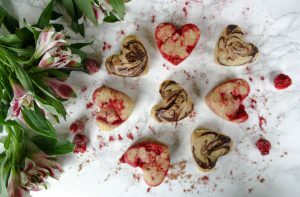 Do that for half of your heart shape moulds. For the remaining moulds, instead of the chocolate sauce pour 1 tbsp. of the raspberry coulis in the centre and cover with more batter. Place in the oven for 15 to 20 min until golden brown. When ready, take out of the oven and cool on a wire rack for 10 minutes. Le seul problème avec ces petits gâteaux est que si on en mange 1 on en reprend un deuxième et l envie d’en prendre un troisième nous démange pourquoi ?